"Breath" redirects here. For other uses, see Breath (disambiguation). For other uses, see Breathing (disambiguation). 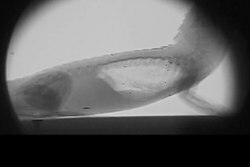 X-ray video of a female American alligator while breathing. Breathing (or ventilation) is the process of moving air into and out of the lungs to facilitate gas exchange with the internal environment, mostly by bringing in oxygen and flushing out carbon dioxide. All aerobic creatures need oxygen for cellular respiration, which uses the oxygen to break down foods for energy and produces carbon dioxide as a waste product. Breathing, or "external respiration", brings air into the lungs where gas exchange takes place in the alveoli through diffusion. The body's circulatory system transports these gases to and from the cells, where "cellular respiration" takes place. The breathing of all vertebrates with lungs consists of repetitive cycles of inhalation and exhalation through a highly branched system of tubes or airways which lead from the nose to the alveoli. The number of respiratory cycles per minute is the breathing or respiratory rate, and is one of the four primary vital signs of life. Under normal conditions the breathing depth and rate is automatically, and unconsciously, controlled by several homeostatic mechanisms which keep the partial pressures of carbon dioxide and oxygen in the arterial blood constant. Keeping the partial pressure of carbon dioxide in the arterial blood unchanged under a wide variety of physiological circumstances, contributes significantly to tight control of the pH of the extracellular fluids (ECF). Over-breathing (hyperventilation) and under-breathing (hypoventilation), which decrease and increase the arterial partial pressure of carbon dioxide respectively, cause a rise in the pH of ECF in the first case, and a lowering of the pH in the second. Both cause distressing symptoms. Breathing has other important functions. It provides a mechanism for speech, laughter and similar expressions of the emotions. It is also used for reflexes such as yawning, coughing and sneezing. Animals that cannot thermoregulate by perspiration, because they lack sufficient sweat glands, may lose heat by evaporation through panting. The effect of the muscles of inhalation in expanding the rib cage. 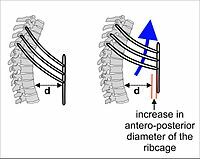 The particular action illustrated here is called the pump handle movement of the rib cage. In this view of the rib cage the downward slope of the lower ribs from the midline outwards can be clearly seen. This allows a movement similar to the "pump handle effect", but in this case, it is called the bucket handle movement. The color of the ribs refers to their classification and is not relevant here. The muscles of breathing at rest: inhalation on the left, exhalation on the right. Contracting muscles are shown in red; relaxed muscles in blue. Contraction of the diaphragm generally contributes the most to the expansion of the chest cavity (light blue). However, at the same time, the intercostal muscles pull the ribs upwards (their effect is indicated by arrows) also causing the rib cage to expand during inhalation (see diagram on another side of the page). 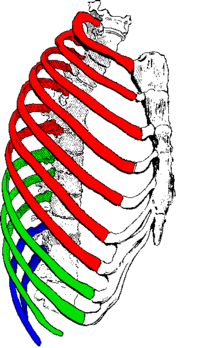 The relaxation of all these muscles during exhalation causes the rib cage and abdomen (light green) to elastically return to their resting positions. Compare these diagrams with the MRI video at the top of the page. The muscles of forceful breathing (inhalation and exhalation). The color code is the same as on the left. In addition to a more forceful and extensive contraction of the diaphragm, the intercostal muscles are aided by the accessory muscles of inhalation to exaggerate the movement of the ribs upwards, causing a greater expansion of the rib cage. During exhalation, apart from the relaxation of the muscles of inhalation, the abdominal muscles actively contract to pull the lower edges of the rib cage downwards decreasing the volume of the rib cage, while at the same time pushing the diaphragm upwards deep into the thorax. 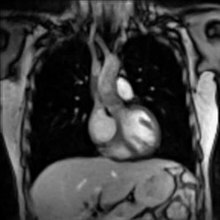 The lungs are not capable of inflating themselves, and will expand only when there is an increase in the volume of the thoracic cavity. In humans, as in the other mammals, this is achieved primarily through the contraction of the diaphragm, but also by the contraction of the intercostal muscles which pull the rib cage upwards and outwards as shown in the diagrams on the left. During forceful inhalation (Figure on the right) the accessory muscles of inhalation, which connect the ribs and sternum to the cervical vertebrae and base of the skull, in many cases through an intermediary attachment to the clavicles, exaggerate the pump handle and bucket handle movements (see illustrations on the left), bringing about a greater change in the volume of the chest cavity. 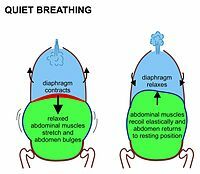 During exhalation (breathing out), at rest, all the muscles of inhalation relax, returning the chest and abdomen to a position called the “resting position”, which is determined by their anatomical elasticity. At this point the lungs contain the functional residual capacity of air, which, in the adult human, has a volume of about 2.5–3.0 liters. During heavy breathing (hyperpnea) as, for instance, during exercise, exhalation is brought about by relaxation of all the muscles of inhalation, (in the same way as at rest), but, in addition, the abdominal muscles, instead of being passive, now contract strongly causing the rib cage to be pulled downwards (front and sides). This not only decreases the size of the rib cage but also pushes the abdominal organs upwards against the diaphragm which consequently bulges deeply into the thorax. The end-exhalatory lung volume is now less air than the resting "functional residual capacity". However, in a normal mammal, the lungs cannot be emptied completely. In an adult human, there is always still at least one liter of residual air left in the lungs after maximum exhalation. 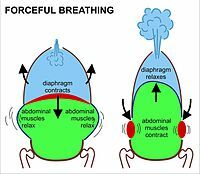 Diaphragmatic breathing causes the abdomen to rhythmically bulge out and fall back. It is, therefore, often referred to as "abdominal breathing". These terms are often used interchangeably because they describe the same action. When the accessory muscles of inhalation are activated, especially during labored breathing, the clavicles are pulled upwards, as explained above. This external manifestation of the use of the accessory muscles of inhalation is sometimes referred to as clavicular breathing, seen especially during asthma attacks and in people with chronic obstructive pulmonary disease. Inhaled air is warmed and moistened by the wet, warm nasal mucosa, which consequently cools and dries. When warm, wet air from the lungs is breathed out through the nose, the cold hygroscopic mucus in the cool and dry nose re-captures some of the warmth and moisture from that exhaled air. In very cold weather the re-captured water may cause a "dripping nose". Following on from the above diagram, if the exhaled air is breathed out through the mouth on a cold and humid conditions, the water vapor will condense into a visible cloud or mist. Usually, air is breathed in and out through the nose. The nasal cavities (between the nostrils and the pharynx) are quite narrow, firstly by being divided in two by the nasal septum, and secondly by lateral walls that have several longitudinal folds, or shelves, called nasal conchae, thus exposing a large area of nasal mucous membrane to the air as it is inhaled (and exhaled). This causes the inhaled air to take up moisture from the wet mucus, and warmth from the underlying blood vessels, so that the air is very nearly saturated with water vapor and is at almost body temperature by the time it reaches the larynx. Part of this moisture and heat is recaptured as the exhaled air moves out over the partially dried-out, cooled mucus in the nasal passages, during breathing out. The sticky mucus also traps much of the particulate matter that is breathed in, preventing it from reaching the lungs. The anatomy of a typical mammalian respiratory system, below the structures normally listed among the "upper airways" (the nasal cavities, the pharynx, and larynx), is often described as a respiratory tree or tracheobronchial tree (figure on the left). Larger airways give rise to branches that are slightly narrower, but more numerous than the "trunk" airway that gives rise to the branches. The human respiratory tree may consist of, on average, 23 such branchings into progressively smaller airways, while the respiratory tree of the mouse has up to 13 such branchings. 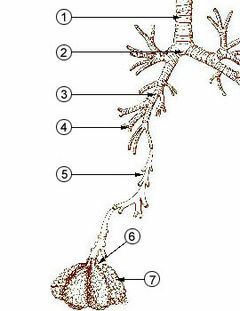 Proximal divisions (those closest to the top of the tree, such as the trachea and bronchi) function mainly to transmit air to the lower airways. Later divisions such as the respiratory bronchioles, alveolar ducts and alveoli are specialized for gas exchange. The trachea and the first portions of the main bronchi are outside the lungs. The rest of the "tree" branches within the lungs, and ultimately extends to every part of the lungs. The alveoli are the blind-ended terminals of the "tree", meaning that any air that enters them has to exit via the same route it used to enter the alveoli. A system such as this creates dead space, a volume of air that fills the airways (the dead space) at the end of inhalation, and is breathed out, unchanged, during the next exhalation, never having reached the alveoli. Similarly, the dead space is filled with alveolar air at the end of exhalation, and is the first air to breathed back into the alveoli, before any fresh air reaches the alveoli during inhalation. The dead space volume of a typical adult human is about 150 ml. The primary purpose of breathing is to bring atmospheric air (in small doses) into the alveoli where gas exchange with the gases in the blood takes place. The equilibration of the partial pressures of the gases in the alveolar blood and the alveolar air occurs by diffusion. At the end of each exhalation, the adult human lungs still contain 2,500–3,000 mL of air, their functional residual capacity or FRC. With each breath (inhalation) only as little as about 350 mL of warm, moistened atmospherically is added, and well mixed, with the FRC. Consequently, the gas composition of the FRC changes very little during the breathing cycle. Since the pulmonary capillary blood equilibrates with this virtually unchanging mixture of air in the lungs (which has a substantially different composition from that of the ambient air), the partial pressures of the arterial blood gases also do not change with each breath. The tissues are therefore not exposed to swings in oxygen and carbon dioxide tensions in the blood during the breathing cycle, and the peripheral and central chemoreceptors do not need to "choose" the point in the breathing cycle at which the blood gases need to be measured, and responded to. Thus the homeostatic control of the breathing rate simply depends on the partial pressures of oxygen and carbon dioxide in the arterial blood. This then also maintains the constancy of the pH of the blood. The rate and depth of breathing is automatically controlled by the respiratory centers that receive information from the peripheral and central chemoreceptors. These chemoreceptors continuously monitor the partial pressures of carbon dioxide and oxygen in the arterial blood. The sensors are, firstly, the central chemoreceptors on the surface of the medulla oblongata of the brain stem which are particularly sensitive to pH as well as the partial pressure of carbon dioxide in the blood and cerebrospinal fluid. The second group of sensors measure the partial pressure of oxygen in the arterial blood. Together the latter is known as the peripheral chemoreceptors which are situated in the aortic and carotid bodies. Information from all of these chemoreceptors is conveyed to the respiratory centers in the pons and medulla oblongata, which responds to deviations in the partial pressures of carbon dioxide and oxygen in the arterial blood from normal by adjusting the rate and depth of breathing, in such a way as to restore partial pressure of carbon dioxide back to 5.3 kPa (40 mm Hg), the pH to 7.4 and, to a lesser extent, the partial pressure of oxygen to 13 kPa (100 mm Hg). For instance, exercise increases the production of carbon dioxide by the active muscles. This carbon dioxide diffuses into the venous blood and ultimately raises the partial pressure of carbon dioxide in the arterial blood. This is immediately sensed by the carbon dioxide chemoreceptors on the brain stem. The respiratory centers respond to this information by causing the rate and depth of breathing to increase to such an extent that the partial pressures of carbon dioxide and oxygen in the arterial blood return almost immediately to the same levels as at rest. The respiratory centers communicate with the muscles of breathing via motor nerves, of which the phrenic nerves, which innervate the diaphragm, are probably the most important. Automatic breathing can be overridden to a limited extent by simple choice, or to facilitate swimming, speech, singing or other vocal training. It is impossible to suppress the urge to breathe to the point of hypoxia but training can increase the ability to breath-hold; for example, in February 2016, a Spanish, professional freediver broke the world record for holding the breath underwater at just over 24 minutes. Other automatic breathing control reflexes also exist. Submersion, particularly of the face, in cold water, triggers a response called the diving reflex. This firstly has the result of shutting down the airways against the influx of water. The metabolic rate slows right down. This is coupled with intense vasoconstriction of the arteries to the limbs and abdominal viscera. This reserves the oxygen that is in blood and lungs at the beginning of the dive almost exclusively for the heart and the brain. The diving reflex is an often-used response in animals that routinely need to dive, such as penguins, seals and whales. It is also more effective in very young infants and children than in adults. Inhaled air is by volume 78.08% nitrogen, 20.95% oxygen and small amounts include argon, carbon dioxide, neon, helium, and hydrogen. 1% argon and several parts per million (ppm) of hydrogen and carbon monoxide, 1 ppm of ammonia and less than 1 ppm of acetone, methanol, ethanol and other volatile organic compounds. In addition to air, underwater divers practicing technical diving may breathe oxygen-rich, oxygen-depleted or helium-rich breathing gas mixtures. Oxygen and analgesic gases are sometimes given to patients under medical care. The atmosphere in space suits is pure oxygen. However, this is kept at around 20% of Earthbound atmospheric pressure to regulate the rate of inspiration. The atmospheric pressure decreases exponentially with altitude, roughly halving with every 5,500 metres (18,000 ft) rise in altitude. The composition of atmospheric air is, however, almost constant below 80 km, as a result of the continuous mixing effect of the weather. The concentration of oxygen in the air (mmols O2 per liter of air) therefore decreases at the same rate as the atmospheric pressure. At sea level, where the ambient pressure is about 100 kPa, oxygen contributes 21% of the atmosphere and the partial pressure of oxygen (PO2) is 21 kPa (i.e. 21% of 100 kPa). At the summit of Mount Everest, 8,848 metres (29,029 ft), where the total atmospheric pressure is 33.7 kPa, oxygen still contributes 21% of the atmosphere but its partial pressure is only 7.1 kPa (i.e. 21% of 33.7 kPa = 7.1 kPa). Therefore, a greater volume of air must be inhaled at altitude than at sea level in order to breath in the same amount of oxygen in a given period. During inhalation, air is warmed and saturated with water vapor as it passes through the nose and pharynx before it enters the alveoli. The saturated vapor pressure of water is dependent only on temperature; at a body core temperature of 37 °C it is 6.3 kPa (47.0 mmHg), regardless of any other influences, including altitude. Consequently, at sea level, the tracheal air (immediately before the inhaled air enters the alveoli) consists of: water vapor (PH2O = 6.3 kPa), nitrogen (PN2 = 74.0 kPa), oxygen (PO2 = 19.7 kPa) and trace amounts of carbon dioxide and other gases, a total of 100 kPa. In dry air, the PO2 at sea level is 21.0 kPa, compared to a PO2 of 19.7 kPa in the tracheal air (21% of [100 – 6.3] = 19.7 kPa). At the summit of Mount Everest tracheal air has a total pressure of 33.7 kPa, of which 6.3 kPa is water vapor, reducing the PO2 in the tracheal air to 5.8 kPa (21% of [33.7 – 6.3] = 5.8 kPa), beyond what is accounted for by a reduction of atmospheric pressure alone (7.1 kPa). The pressure gradient forcing air into the lungs during inhalation is also reduced by altitude. Doubling the volume of the lungs halves the pressure in the lungs at any altitude. Having the sea level air pressure (100 kPa) results in a pressure gradient of 50 kPa but doing the same at 5500 m, where the atmospheric pressure is 50 kPa, a doubling of the volume of the lungs results in a pressure gradient of the only 25 kPa. In practice, because we breathe in a gentle, cyclical manner that generates pressure gradients of only 2–3 kPa, this has little effect on the actual rate of inflow into the lungs and is easily compensated for by breathing slightly deeper. The lower viscosity of air at altitude allows air to flow more easily and this also helps compensate for any loss of pressure gradient. All of the above effects of low atmospheric pressure on breathing are normally accommodated by increasing the respiratory minute volume (the volume of air breathed in – or out – per minute), and the mechanism for doing this is automatic. The exact increase required is determined by the respiratory gases homeostatic mechanism, which regulates the arterial PO2 and PCO2. This homeostatic mechanism prioritizes the regulation of the arterial PCO2 over that of oxygen at sea level. That is to say, at sea level the arterial PCO2 is maintained at very close to 5.3 kPa (or 40 mmHg) under a wide range of circumstances, at the expense of the arterial PO2, which is allowed to vary within a very wide range of values, before eliciting a corrective ventilatory response. However, when the atmospheric pressure (and therefore the atmospheric PO2) falls to below 75% of its value at sea level, oxygen homeostasis is given priority over carbon dioxide homeostasis. This switch-over occurs at an elevation of about 2,500 metres (8,200 ft). If this switch occurs relatively abruptly, the hyperventilation at high altitude will cause a severe fall in the arterial PCO2 with a consequent rise in the pH of the arterial plasma leading to respiratory alkalosis. This is one contributor to high altitude sickness. On the other hand, if the switch to oxygen homeostasis is incomplete, then hypoxia may complicate the clinical picture with potentially fatal results. Pressure increases with the depth of water at the rate of about one atmosphere – slightly more than 100 kPa, or one bar, for every 10 meters. Air breathed underwater by divers is at the ambient pressure of the surrounding water and this has a complex range of physiological and biochemical implications. If not properly managed, breathing compressed gasses underwater may lead to several diving disorders which include pulmonary barotrauma, decompression sickness, nitrogen narcosis, and oxygen toxicity. The effects of breathing gasses under pressure are further complicated by the use of one or more special gas mixtures. Air is provided by a diving regulator, which reduces the high pressure in a diving cylinder to the ambient pressure. The breathing performance of regulators is a factor when choosing a suitable regulator for the type of diving to be undertaken. It is desirable that breathing from a regulator requires low effort even when supplying large amounts of air. It is also recommended that it supplies air smoothly without any sudden changes in resistance while inhaling or exhaling. In the graph, right, note the initial spike in pressure on exhaling to open the exhaust valve and that the initial drop in pressure on inhaling is soon overcome as the Venturi effect designed into the regulator to allow an easy draw of air. Many regulators have an adjustment to change the ease of inhaling so that breathing is effortless. Abnormal breathing patterns include Kussmaul breathing, Biot's respiration and Cheyne–Stokes respiration. Other breathing disorders include shortness of breath (dyspnea), stridor, apnea, sleep apnea (most commonly obstructive sleep apnea), mouth breathing, and snoring. Many conditions are associated with obstructed airways. Hypopnea refers to overly shallow breathing; hyperpnea refers to fast and deep breathing brought on by a demand for more oxygen, as for example by exercise. The terms hypoventilation and hyperventilation also refer to shallow breathing and fast and deep breathing respectively, but under inappropriate circumstances or disease. However, this distinction (between, for instance, hyperpnea and hyperventilation) is not always adhered to, so that these terms are frequently used interchangeably. A range of breath tests can be used to diagnose diseases such as dietary intolerances. A rhinomanometer uses acoustic technology to examine the air flow through the nasal passages. The word "spirit" comes from the Latin spiritus, meaning breath. Historically, breath has often been considered in terms of the concept of life force. The Hebrew Bible refers to God breathing the breath of life into clay to make Adam a living soul (nephesh). It also refers to the breath as returning to God when a mortal dies. The terms spirit, prana, the Polynesian mana, the Hebrew ruach and the psyche in psychology are related to the concept of breath. In T'ai chi, aerobic exercise is combined with specific breathing exercises to strengthen the diaphragm muscles, improve posture and make better use of the body's Qi, (energy). Different forms of meditation, and yoga advocate various breathing methods. A form of Buddhist meditation called anapanasati meaning mindfulness of breath was first introduced by Buddha. Breathing disciplines are incorporated into meditation, certain forms of yoga such as pranayama, and the Buteyko method as a treatment for asthma and other conditions. In music, some wind instrument players use a technique called circular breathing. Singers also rely on breath control. Common cultural expressions related to breathing include: "to catch my breath", "took my breath away", "inspiration", "to expire", "get my breath back". Certain breathing patterns have a tendency to occur with certain moods. Due to this relationship, practitioners of various disciplines consider that they can encourage the occurrence of a particular mood by adopting the breathing pattern that it most commonly occurs in conjunction with. For instance, and perhaps the most common recommendation is that deeper breathing which utilizes the diaphragm and abdomen more can encourage a more relaxed and confident mood. Practitioners of different disciplines often interpret the importance of breathing regulation and its perceived influence on mood in different ways. Buddhists may consider that it helps precipitate a sense of inner-peace, holistic healers that it encourages an overall state of health and business advisers that it provides relief from work-based stress. During physical exercise, a deeper breathing pattern is adapted to facilitate greater oxygen absorption. An additional reason for the adoption of a deeper breathing pattern is to strengthen the body’s core. During the process of deep breathing, the thoracic diaphragm adopts a lower position in the core and this helps to generate intra-abdominal pressure which strengthens the lumbar spine. Typically, this allows for more powerful physical movements to be performed. As such, it is frequently recommended when lifting heavy weights to take a deep breath or adopt a deeper breathing pattern. ^ Hall, John (2011). Guyton and Hall textbook of medical physiology (12th ed.). Philadelphia, Pa.: Saunders/Elsevier. p. 5. ISBN 978-1-4160-4574-8. ^ Pocock, Gillian; Richards, Christopher D. (2006). Human physiology : the basis of medicine (3rd ed.). Oxford: Oxford University Press. p. 311. ISBN 978-0-19-856878-0. ^ Pocock, Gillian; Richards, Christopher D. (2006). Human physiology : the basis of medicine (3rd ed.). Oxford: Oxford University Press. p. 320. ISBN 978-0-19-856878-0. ^ "Vital Signs 101". www.hopkinsmedicine.org. ^ Pocock, Gillian; Richards, Christopher D. (2006). Human physiology : the basis of medicine (3rd ed.). Oxford: Oxford University Press. p. 316. ISBN 978-0-19-856878-0. ^ Levitzky, Michael G. (2013). Pulmonary physiology (Eighth ed.). New York: McGraw-Hill Medical. p. Chapter 1. Function and Structure of the Respiratory System. ISBN 978-0-07-179313-1. ^ a b c d e f g h i j k l m n o Tortora, Gerard J.; Anagnostakos, Nicholas P. (1987). Principles of anatomy and physiology (Fifth ed.). New York: Harper & Row, Publishers. pp. 556–582. ISBN 978-0-06-350729-6. ^ a b Williams, Peter L; Warwick, Roger; Dyson, Mary; Bannister, Lawrence H. (1989). Gray's Anatomy (Thirty-seventh ed.). Edinburgh: Churchill Livingstone. pp. 1172–1173, 1278–1282. ISBN 0443 041776. ^ Gilroy, Anne M.; MacPherson, Brian R.; Ross, Lawrence M. (2008). Atlas of Anatomy. Stuttgart: Thieme. pp. 108–111. ISBN 978-1-60406-062-1. ^ "Longest time breath held voluntarily (male)". Guinness World Records. Retrieved 2016-11-29. ^ a b Michael Panneton, W (2013). "The Mammalian Diving Response: An Enigmatic Reflex to Preserve Life?". Physiology. 28 (5): 284–297. doi:10.1152/physiol.00020.2013. PMC 3768097. PMID 23997188. ^ Lindholm, Peter; Lundgren, Claes EG (1 January 2009). "The physiology and pathophysiology of human breath-hold diving". Journal of Applied Physiology. 106 (1): 284–292. doi:10.1152/japplphysiol.90991.2008. PMID 18974367. Retrieved 4 April 2015. ^ Thornton SJ, Hochachka PW (2004). "Oxygen and the diving seal". Undersea Hyperb Med. 31 (1): 81–95. PMID 15233163. Retrieved 2008-06-14. ^ Zapol WM, Hill RD, Qvist J, Falke K, Schneider RC, Liggins GC, Hochachka PW (September 1989). "Arterial gas tensions and hemoglobin concentrations of the freely diving Weddell seal". Undersea Biomed Res. 16 (5): 363–73. PMID 2800051. Retrieved 2008-06-14. ^ Pedroso, F. S.; Riesgo, R. S.; Gatiboni, T; Rotta, N. T. (2012). "The diving reflex in healthy infants in the first year of life". Journal of Child Neurology. 27 (2): 168–71. doi:10.1177/0883073811415269. PMID 21881008. ^ "Earth Fact Sheet". nssdc.gsfc.nasa.gov. ^ P.S.Dhami; G.Chopra; H.N. Shrivastava (2015). A Textbook of Biology. Jalandhar, Punjab: Pradeep Publications. pp. V/101. ^ Biology. NCERT. 2015. ISBN 978-81-7450-496-8. ^ "Online high altitude oxygen calculator". altitude.org. Archived from the original on 29 July 2012. Retrieved 15 August 2007. ^ a b c Tyson, P.D. ; Preston-White, R.A. (2013). The weather and climate of Southern Africa. Cape Town: Oxford University Press. pp. 3–10, 14–16, 360. ISBN 9780195718065. ^ Koen, Chrisvan L.; Koeslag, Johan H. (1995). "On the stability of subatmospheric intrapleural and intracranial pressures". News in Physiological Sciences. 10: 176–178. ^ West, J.B. (1985). Respiratory physiology: the essentials. Baltimore: Williams & Wilkins. pp. 21–30, 84–84, 98–101. ^ "Diaphragm function for core stability » Hans Lindgren DC".